The fateful day began with a string of peculiarities, and the Austrian heir died as a result of this large number of “accidents“. According to the schedule, the honored guest was supposed to attend a reception at City Hall and then take off on a planned tour of local sights. But as soon as the initial greeting was over, Franz Ferdinand and his wife hopped into an open-roofed car and sped off into town while the bodyguards of the successor of Emperor Franz Joseph I for some reason were left behind at the train station – quite suprising given the rumors of an assassination attempt had spread through town the day before. But no special security measures were taken even after the Serbian (!) envoy to the Austro-Hungarian Empire had warned of a possible attempt on Franz Ferdinand’s life. The chosen date, June 28, 1914, was also quite strange. It was on that day in 1389 that the Turkish army defeated Serbia and deprived the Slavs of independence for hundreds of years to follow. In 1878, Bosnia and Herzegovina had been occupied by Austria a result of the Russo-Turkish War and was formally annexed by the Hapsburg Empire in 1908. Holding a military holiday on behalf of the new «oppressors» on such a date was bordering on provocation. But the date of the activities was not changed and the Archdukes voyage was not canceled. The modercade of four cars rolled along a the riverbanks of the Miljacka that were packed of people at a speed of 12 kmh. All was triumphant and festive. Spectators along the banks waved and shouted praise in German and Serbian. One 18-year-old onlooker worked his way to the front of the crowd. When he saw the questioning glance of a policeman, he smiled and asked to be able to see the Archduke’s vehicle and at the same moment threw a package bomb at the car. The driver, seeing suspicious movement in the corner of his eye, slammed on the gas and the bomb bounced off the canvas hood of the first vehicle exploding under the wheels of the second., The bomb was packed with nails: Franz Ferdinand was unhurt, but his wife was slightly scratched on the neck. Twenty people in the crowd were injured and two officers in the heir’s entourage. Nedeljko Gabrynowicz (the young terrorist was called) started to run, but was immediately caught. The mayor’s response remains unknwn to this day, along with any additional words from the archduke. However, no extra security measures were taken as a result of their conversation ,despite the obvious danger. Moreover, it was decided to follow the original schedule of the visit! Picture this: a bomb explodes near the vehicle of the Austrian president, but in the course of a couple of hours he is once again driving peacefully through the city, happily waving his hand at the hand at the jubilant crowd. It is simply impossible. But in Sarajevo, that is exactly what happened. A line of cars moved along the promenade going in the opposite direction. This time the cars were driving faster. The heir’s wife continued to sit next to him along with the military governor of Bosnia, General Potiorek. A officer with a sabre on his hip stood aboard the left running board. At one point, in the middle of the road the driver of the first car got lost and accidentally turned right onto Franz Joseph street. The general then noticed that they were going the wrong way and sternly shouted at his driver. The driver braked, drove onto the sidewalk and stopped. The whole motorcade was backed up behind him, so he slowly reversed to avoid causing a traffic jam. Moving in this way, the archdukes vehilce came to a stop in front of the “Morits Schiller Delicatessen.“ In that very spot, a 19-year-old terrorist just happened to be sitting, and who was destined to make history. His name was Gavrilo Princip. But the heir’s trapped car didn’t just stop there, it happened to be standing with its right side to the terrorist, the side with no guard on the running board. The heir and his wife had no cover. Princip drew his revolver and fired two shots at the stationary vehicle. The first bullet hit Sofia, piercing the car’s body and the countess’ tight corset; the second struck the heir to the Austrian throne. Both were killed. Three children agred 10, 12 and 13 years were immediately orphaned. Gabrilo Princip and his accomplice tried to run, but both were quicky caught and severely beaten. They were beaten with fists and feet and even carried a few sword wounds such that Princip’s arm had to be amputated in custody. An investigation was launched almost immediately. The question to be answered at that time was who organized the attack. Here’s the strange part – after showing suspicious negligence in protecting Franz Ferdinand, the Austro-Hungarian justice department showed olympic agility in solving the crime. The investigation took unprecendented speed. Immediately a wave of arrests was made and a clear picture of the crime came to the fore. But the strangely tragic day gives gounds for suspicion that Austro-Hungarian players were involved in the death of the Archduke. In fact, many in the dual empire were unhappy with the possible policies of the future emperor. Married to a Czech, Franz Ferdinand harbored great sympathy for Slavs both inside and outside the empire. He believed that the monarchy would be strengthened by giving rights to the Slavs that would make them equal to the empire’s German and Hungarian citizens. In Budapest and in Vienna itself, such ideas displeased many politicians. In fact, the Slavic areas of the empire included territory administered by the Hungarian monarchy, and if Franz Ferdinands plan came to fruition, Slavs in these areas would recieve autonomy and self-rule. Perhaps this explains the strange behavior of the Austrian security services. But the simplicity and obviousness of the unfortunate murder of the archduke and his wife is very deceptive. It never crossed the minds of the Austro-Hungarian leadership that the simplicity and obviousness of of the finidngs of the investigation were assembled by the conspirators! By disclosing the details of the crime, the Austrain police were able to show … that they organized it! Those who stood behind the 18 assassins needed more than the death of Franz Ferdinand himself. In order for the Austrian investigators to get to those who were truly responsible, they would need to capture the assassins alive. Therefore, all of the participants were supplied with poison capsules! Seeing that they would be unable to escape, Nedeljko Gabrynowicz and Gavril Principle both took their poison. But it didn’t work on either terrorist! This randomness, simple at first glace, is an essential link in the chain of further tragic events! The foresight of the conspirators is stricking: to furnish the assassins with “safe“ poison and time to shoot. The crowd and the proximity of the archduke’s guards on the second opportunity did not give the assassins time to terminate themselves, and so they fell into the hands of the Austrian justice system. It was on the terrorists’ very words that the entire investigation’s findings were based! If the police had been left with two corpses as opposed to two terrorists in perfect condition, the investigation would have ground to a standstill. But, thanks to the strange poison, the investigators received not just a thread, but a whole rope, with which to unravel the mystery. Who gave the assassins safe poison? Whoever had it in their interests that the Austrians would quickly find the suspects and direct their anger towards Serbia. The Serbs themselves had no interest in the police getting their hands on the terrorists alive – it would only hurt the reputation of Serbia’s leadership. All the Austrian secret service need to do was to poorly guard the dignitaries and «neglect» to cover them at the right time. That was the only contribution they needed to make. — those who gave the terrorists safe poison created a pretext for something more than an Austro-Serbian war. And it is not the Serbs, nor the Austrians! 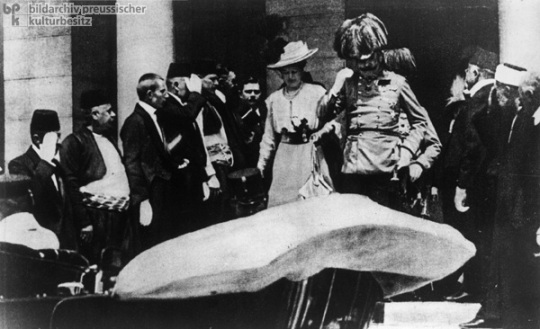 Vienna’s deisre to punish Serbia for malicious activities led to the outbreak of World War I. But let us ask ourselves a simple question: would Serbian organizers of Franz Ferdinand’s death want something greater? Were they looking for a huge and bloody war that would take the lives of millions? Did they want a conflict of THAT SCALE and to fill the Austrians with righteous anger? It was in the interest of Serbian nationalists and some Hungarian politicians to confine the distruction to the archduke, as an individual. Neither the Serbs or Austrians needed a major war. Serbia wanted to sow discourd in the Austro-Hungarian Empire — not to fight it. Further fighting was sure to erupt. Having initially provided decent resistance to Austrian forces, in 1915, the Serbs were routed. Their army was loaded onto the ships of the Entente allies was evacuated to Greece, leaving their country occupied by their adversary. As a result, the casualty rate among Serbian units was the highest among all the belligerent countries! Austria-Hungary used the assassination as an excuse to crack down on restive Serbia and as a result of the small victorious campaign, by the end of the war the empire ceased to exist, split into several states, and the Hapsburg throne lost forever. It is no coincidence that Sir Edward Grey, former British foreign minister wrote in his memoirs, “The world will probably never know the whole truth of the assassination of Franz Ferdinand. It appears that we will never have a single person who would know everything there is to know about this murder. “ What secret was the head of British foreign policy referring to? An investigation quickly and easily named the perpetrators. But the British Foreign Office was saying something quite different: within a month of the assassination of the archduke, World War I had begun, a war in which tens of millions would perish. How it happened? Still no one can explain. In the next chapter we will try to understand who needed a war of unprecedented scale?